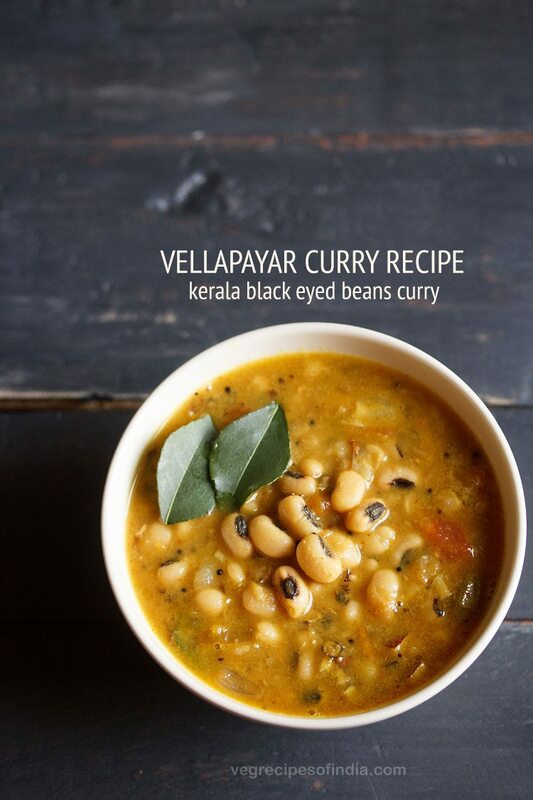 vellapayar curry is a spicy and tasty curry made with black eyed beans or lobia. 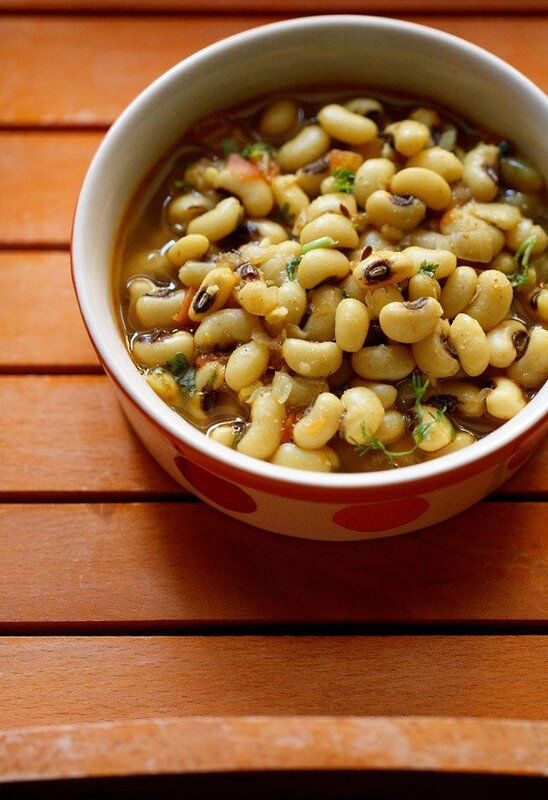 black eyed beans are also called as 'vellapayar' in malayalam language. vellapayar curry recipe with step by step pics. 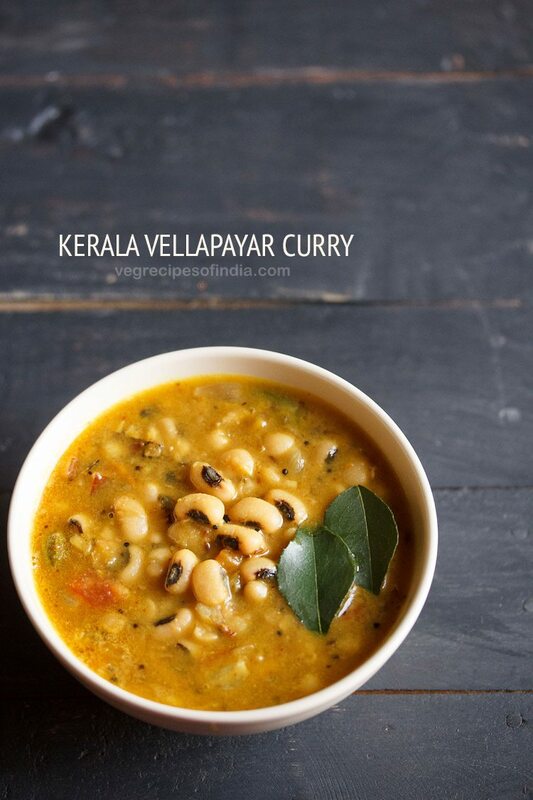 this kerala style vellapayar masala curry is a spicy and tasty curry made with black eyed beans. black eyed beans are also called as ‘vellapayar’ in malayalam language. 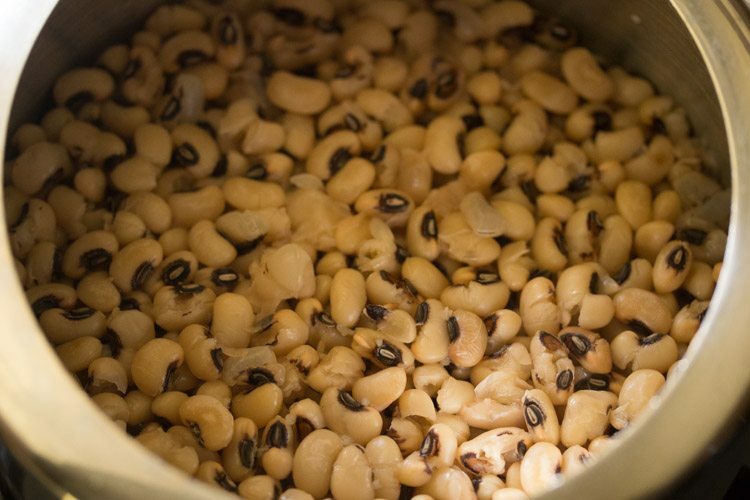 in hindi language, black eyed peas are known as ‘rongi or lobia’ and in marathi language, ‘chawli’. instead of black eyed peas, you can also use red cowpeas (vanpayar in malayalam) to make this delicious curry. this vellapayar curry recipe is from my dad and he usually makes this recipe with mutton or chicken or fish. 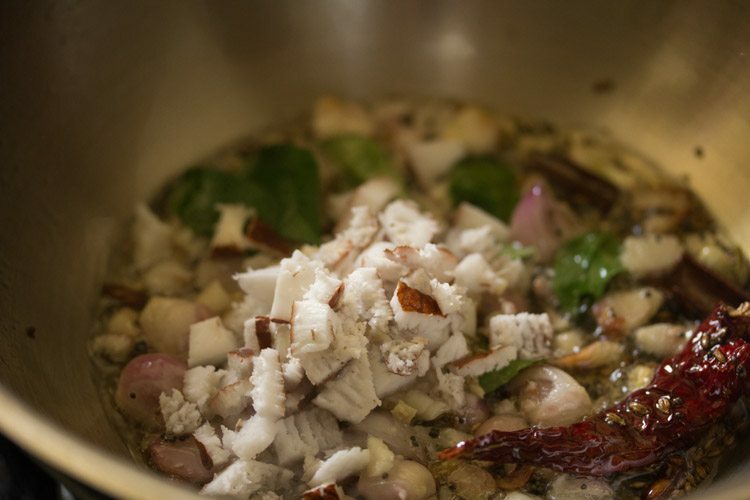 in fish curry kudampuli or kokum or tamarind is added. i take the same ingredients and make the curry with black eyed beans. 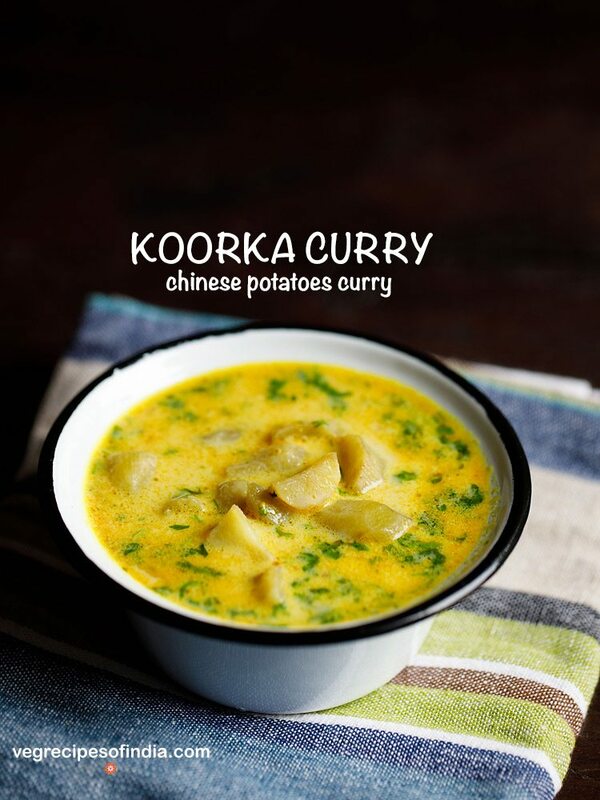 this is a simply super tasty curry and goes well with steamed rice. 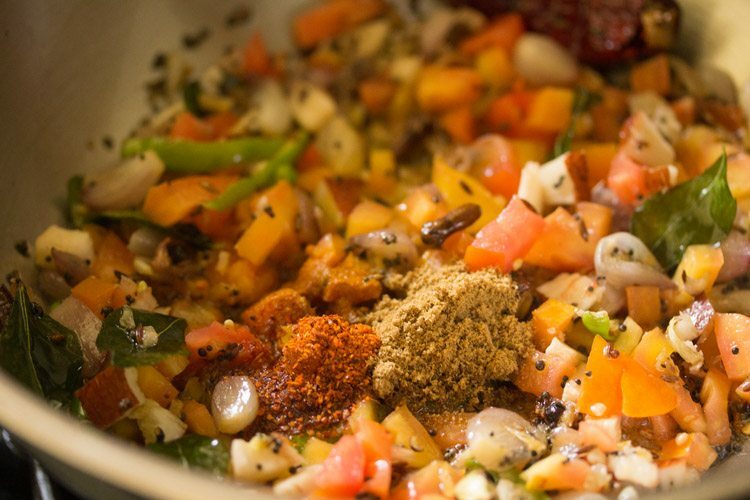 whole spices as well as powdered spices are used in this curry. 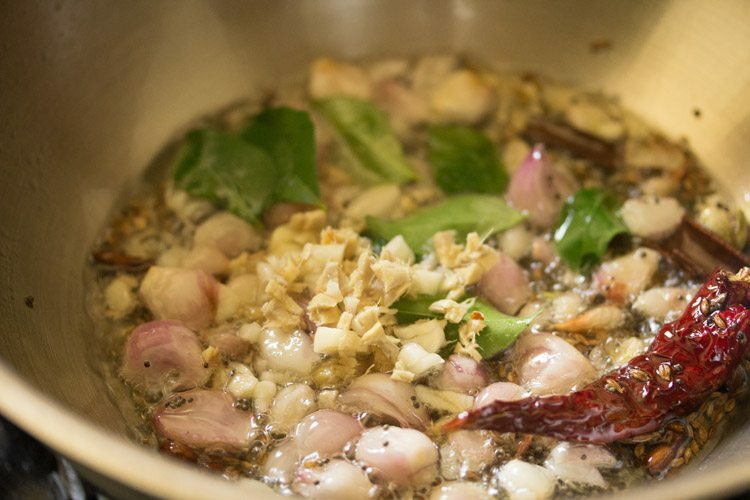 hence the curry is aromatic and has complex flavors. its spicy as well. to cut down on the spicy taste, you can reduce the amount of black pepper and red chili powder. 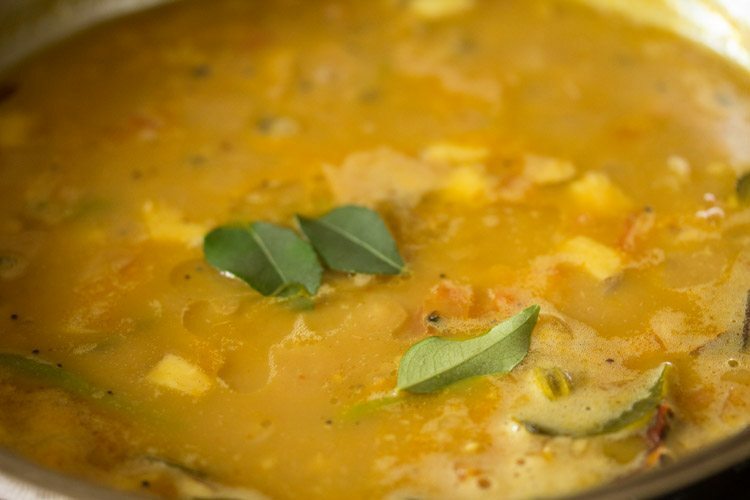 this kerala style lobia curry recipe is very easy to make. 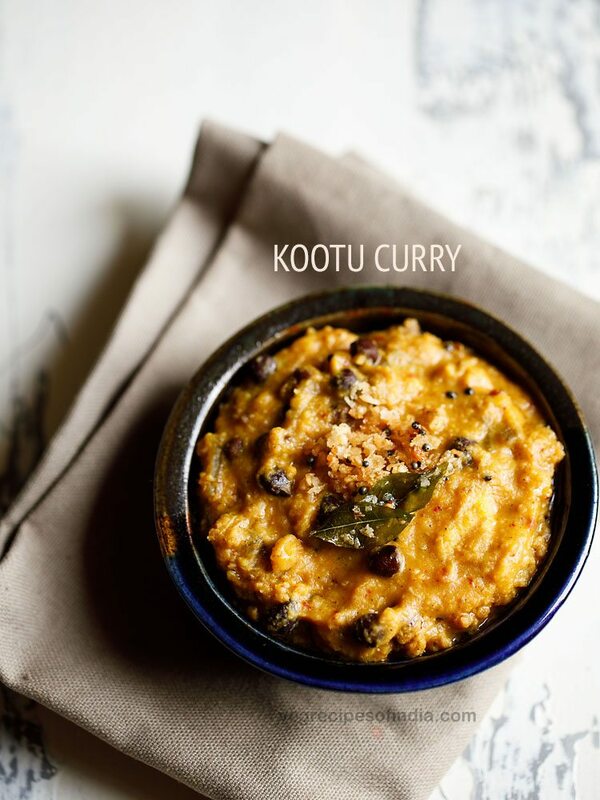 if you like recipes made with black eyed beans then you must give this curry a try. 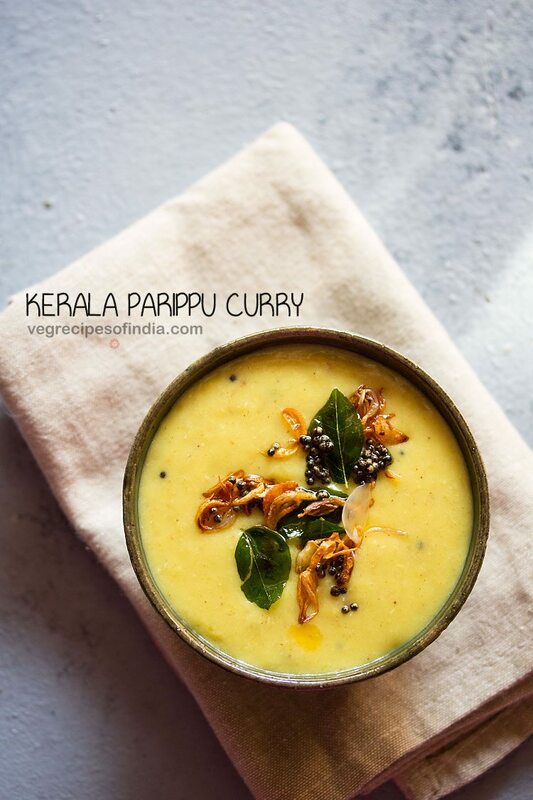 though vellapayar curry recipe goes well with steamed rice, you can even serve it with puttu or appam or idiyappam or with soft dosas like aval dosa or sponge dosa or neer dosa. rinse 1 cup vellapayar (black eyed beans) in water for a couple of times. then add the rinsed beans in a 2 litre pressure cooker. pressure cook for 10 to 12 whistles. timing will vary on the quality of vellapayar. when the pressure settles down on its own, open the lid and check if the beans are cooked well. the beans have to be completely cooked but not mushy or pasty. if they are under cooked, then add some more water and pressure cook for a few more whistles. 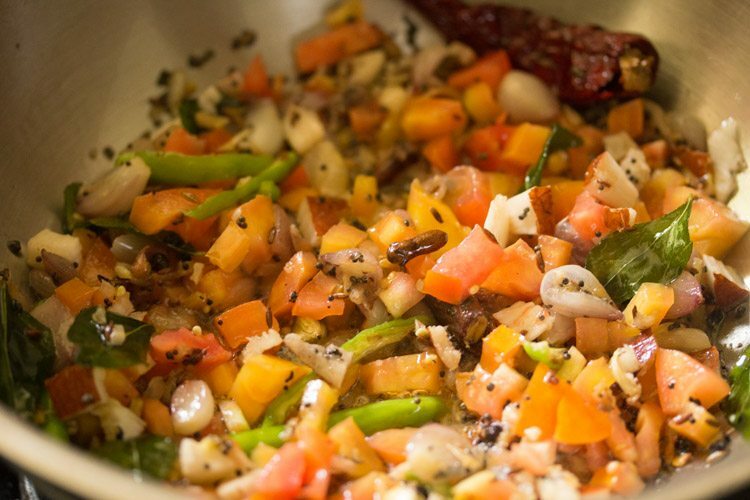 when the vellapayar are getting cooked, you can prep the other ingredients. chop pearl onions (or shallots or onions), tomatoes, ginger, garlic and green chilies. keep flame to a low and add 1 teaspoon mustard seeds and let them crackle. 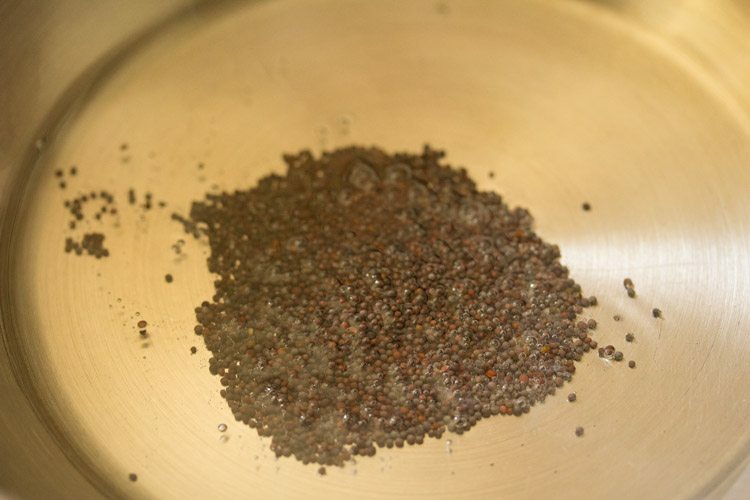 when the mustard seeds crackle, then add ½ teaspoon cumin seeds. let cumin seeds splutter. now add 2 pieces each of 1 inch cinnamon, 2 green cardamoms, 4 cloves and 1 dry red chili. fry for 1 to 2 seconds till the spices become aromatic. the frying of the spices should be done on a low flame. add ⅓ cup sliced pearl onions or shallots or onions. give a stir. 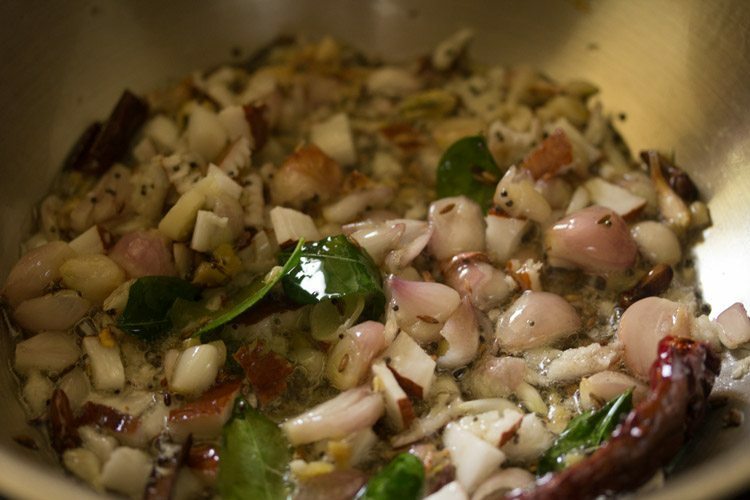 add 8 to 10 curry leaves, 1 teaspoon chopped ginger and 1 teaspoon chopped garlic. also add 2 tablespoons chopped fresh coconut and mix well. then add ¼ teaspoon black pepper, slightly crushed. mix and sauté till the onions become translucent. now add ½ cup chopped tomatoes and 2 green chilies (slit). mix well. then add ¼ teaspoon turmeric powder, ½ teaspoon red chili powder, 1 teaspoon coriander powder and ¼ teaspoon garam masala powder (optional). mix again and begin to sauté tomatoes on a low to medium flame till the tomatoes soften. when sautéing the tomatoes, you could add a few tablespoons of water if the tomato mixture dries up or starts sticking to the pan. now add 1.5 cups water or add as required. add the cooked vellapayar or black eyed peas. season with salt as per taste. mix again. on a low to medium-low flame simmer vellapayar curry for 12 to 15 minutes till the gravy thickens. with a spoon mash some vellapayar (lobia) to thicken the gravy. 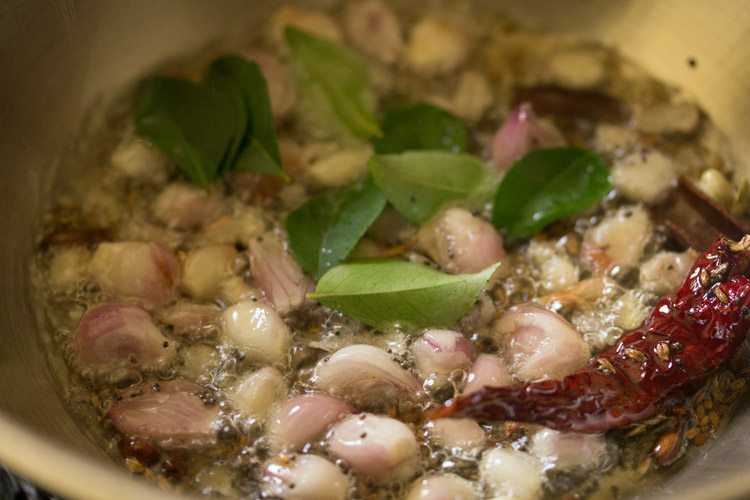 once the vellapayar curry is done, then switch off flame and add 3 to 4 curry leaves. also drizzle 1 teaspoon coconut oil. 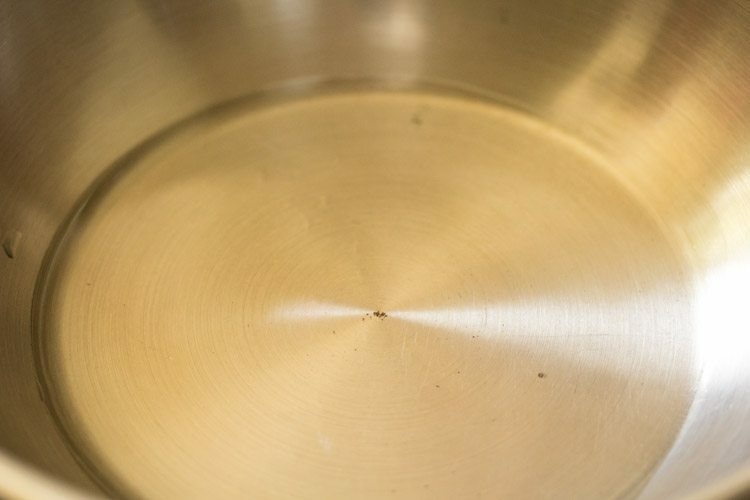 stir and cover the pan. let the flavors infuse for 4 to 5 minutes. 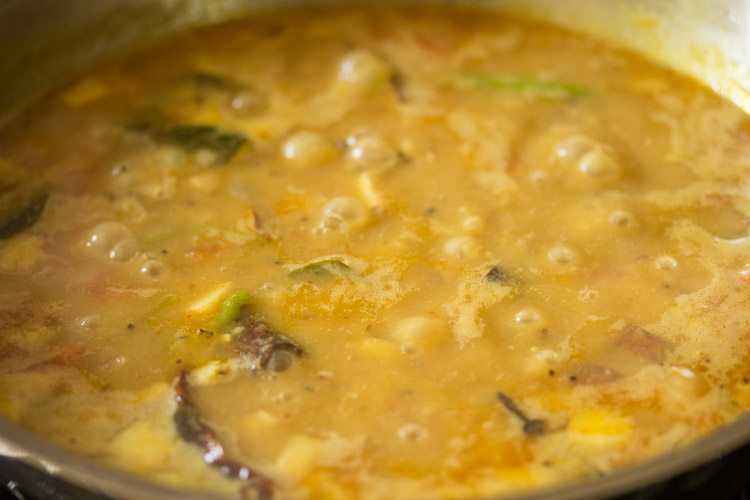 serve kerala vellapayar masala curry with steamed rice, puttu or appam or idiayappam. you can garnish kerala lobia curry with coriander leaves if you want. instead of adding the coconut slices while sautéing, you could also fry them separately in oil till they become golden and crisp and garnish the dish with these fried coconut slices. 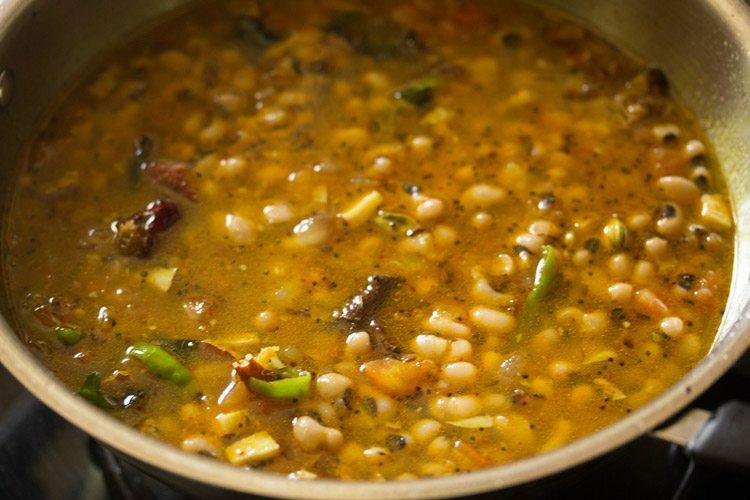 if cooking beans in a pot - rinse and soak beans in enough water for 4 to 5 hours or overnight. 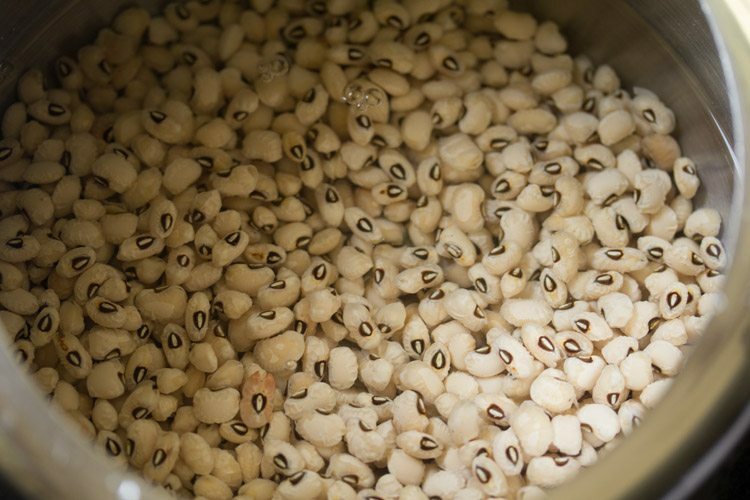 then boil black eyed beans with 3 to 4 cups of water with 1 tsp of salt till they are softened and well cooked. to reduce spiciness, add less black pepper and red chili powder. 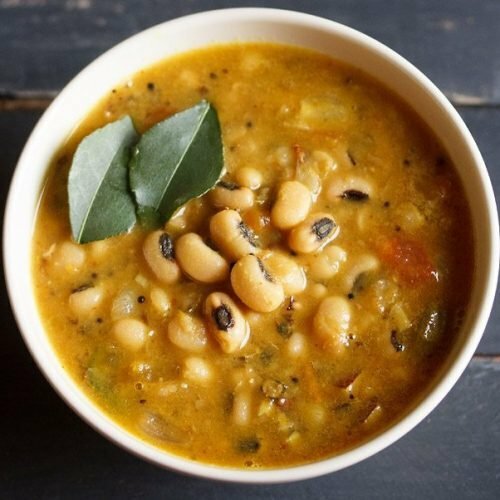 1. rinse 1 cup vellapayar (black eyed beans, lobia, chawli) in water for a couple of times. then add the rinsed beans in a 2 litre pressure cooker. 2. add 2.5 cups water. 3. pressure cook on medium flame for 10 to 12 whistles. 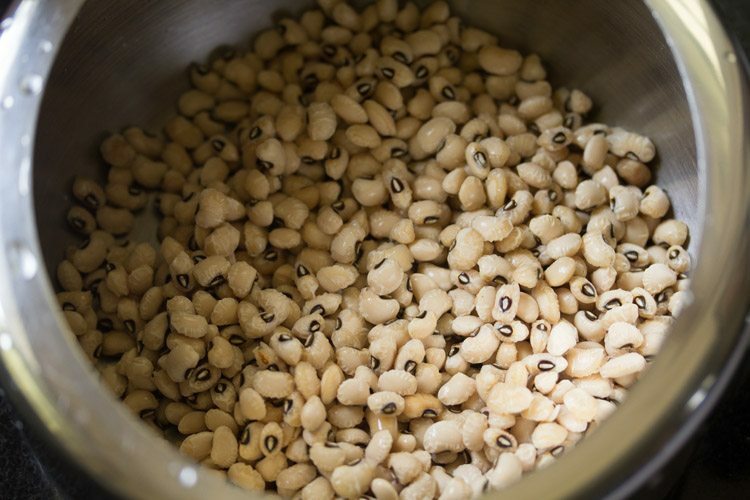 timing will vary on the quality of vellapayar (lobia or black eyed beans). 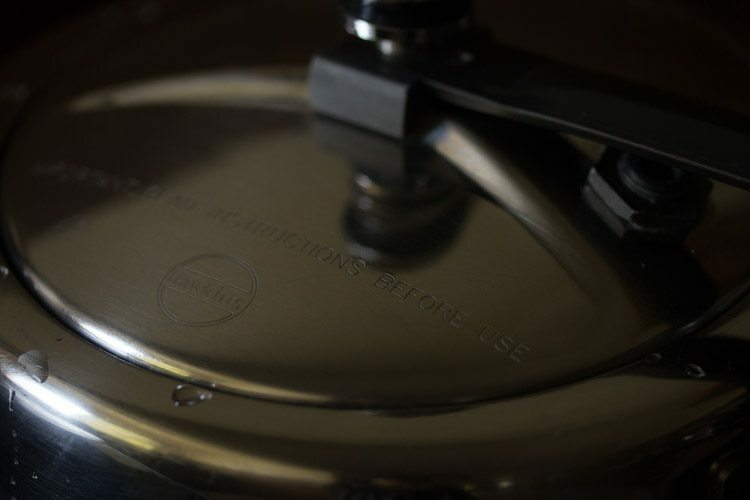 4. when the pressure settles down on its own, open the lid and check if the beans are cooked well. the beans have to be completely cooked but not mushy or pasty. if they are under cooked, then add some more water and pressure cook for a few more whistles. 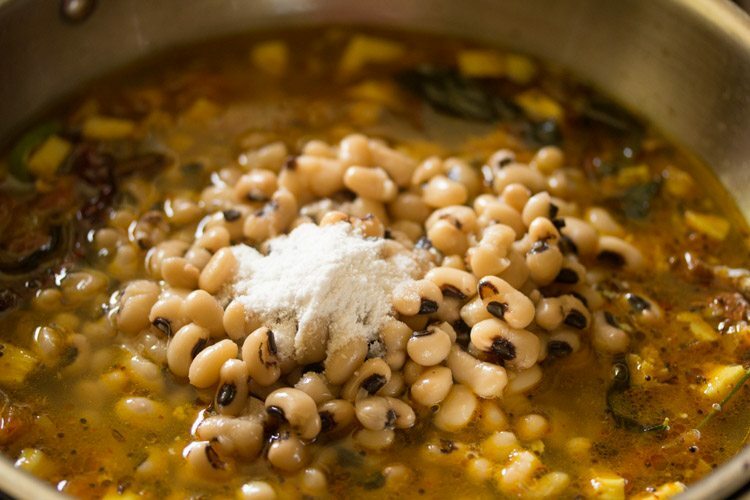 5. when the black eyed beans are getting cooked, you can prep the other ingredients. 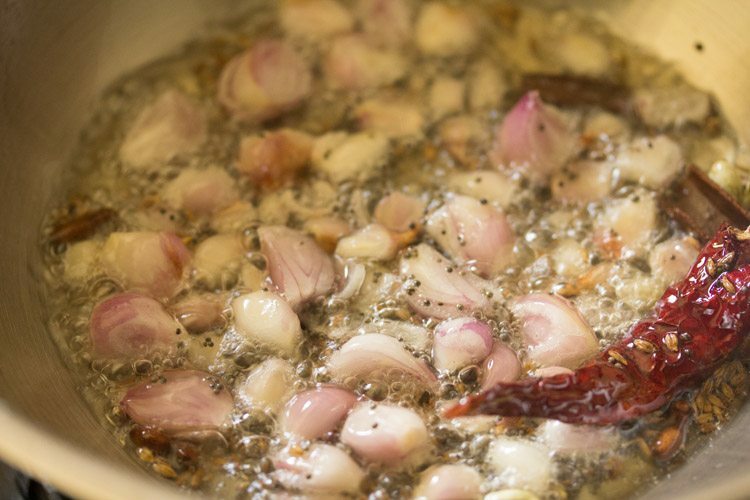 chop pearl onions (or shallots or onions), tomatoes, ginger, garlic and green chilies. 6. heat 3 tablespoons coconut oil in a pan. 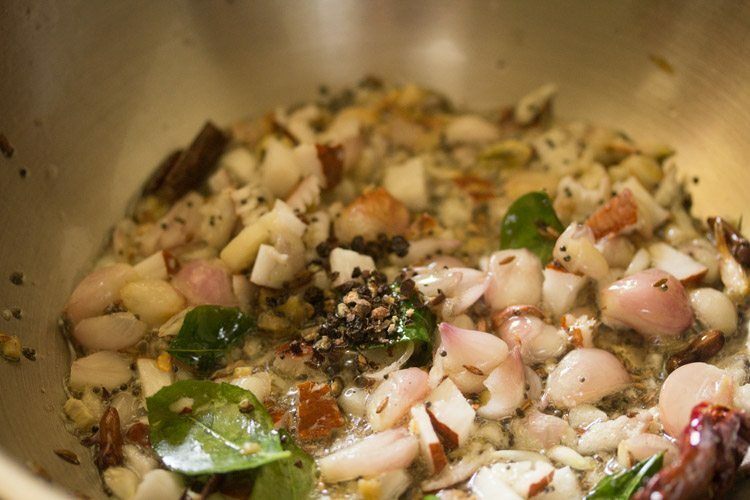 7. keep flame to a low and add 1 teaspoon mustard seeds and let them crackle. 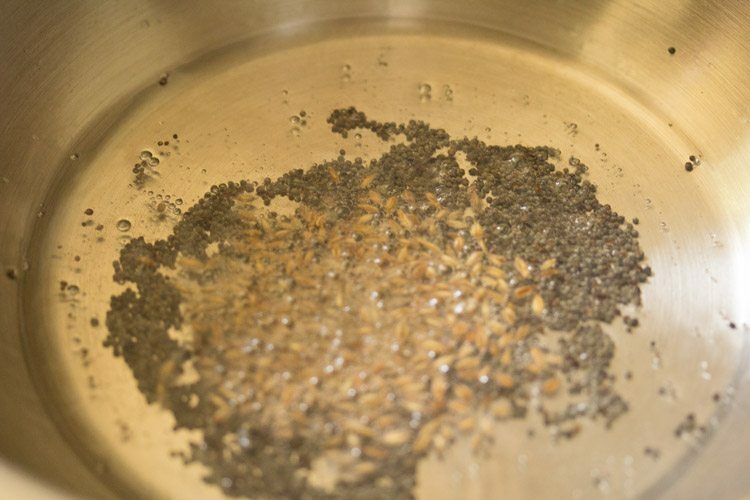 8. when the mustard seeds crackle, then add ½ teaspoon cumin seeds. let cumin seeds splutter. 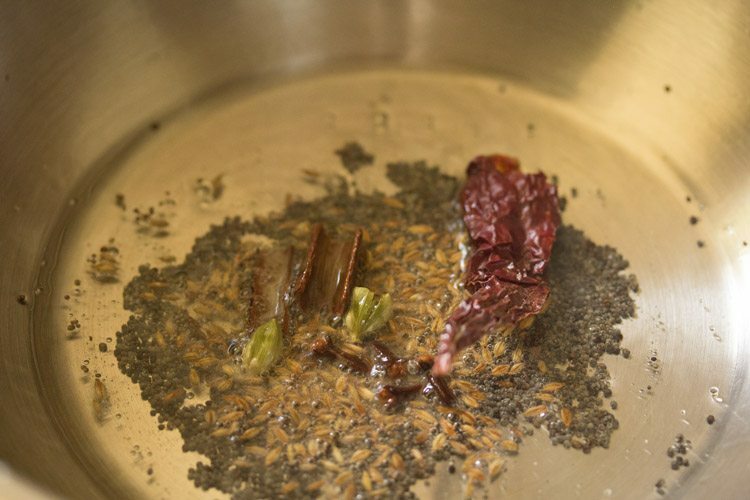 9. now add 2 pieces each of 1 inch cinnamon, 2 green cardamoms, 4 cloves and 1 dry red chili. fry for 1 to 2 seconds till the spices become aromatic. the frying of the spices should be done on a low flame. 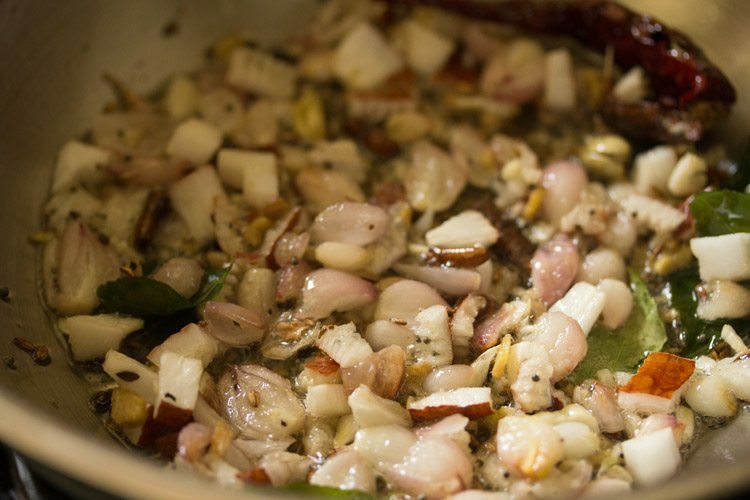 10. add ⅓ cup sliced pearl onions or shallots or onions. give a stir. 11. add 8 to 10 curry leaves. 12. then add 1 teaspoon chopped ginger and 1 teaspoon chopped garlic. 13. add 2 tablespoons chopped fresh coconut. 15. add ¼ teaspoon black pepper, slightly crushed. 16. mix and sauté till the onions become translucent. 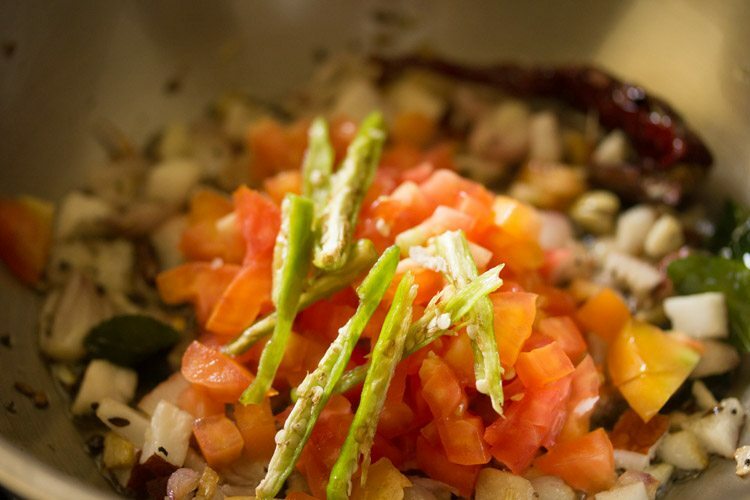 17. now add ½ cup chopped tomatoes and 2 green chilies (slit). 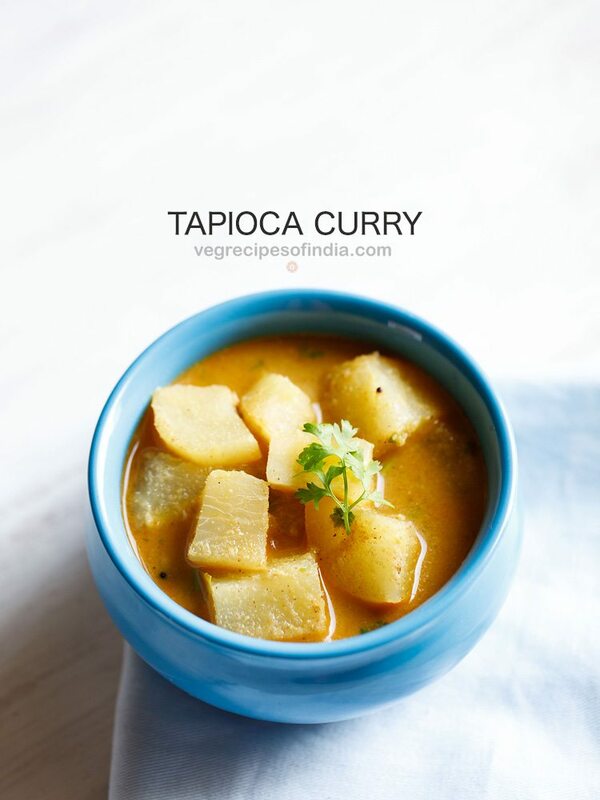 19. then add ¼ teaspoon turmeric powder, ½ teaspoon red chili powder, 1 teaspoon coriander powder and ¼ teaspoon garam masala powder (optional). 20. mix again and begin to sauté tomatoes on a low to medium flame till the tomatoes soften. when sautéing the tomatoes, you could add a few tablespoons of water if the tomato mixture dries up or starts sticking to the pan. 21. now add 1.5 cups water or add as required. 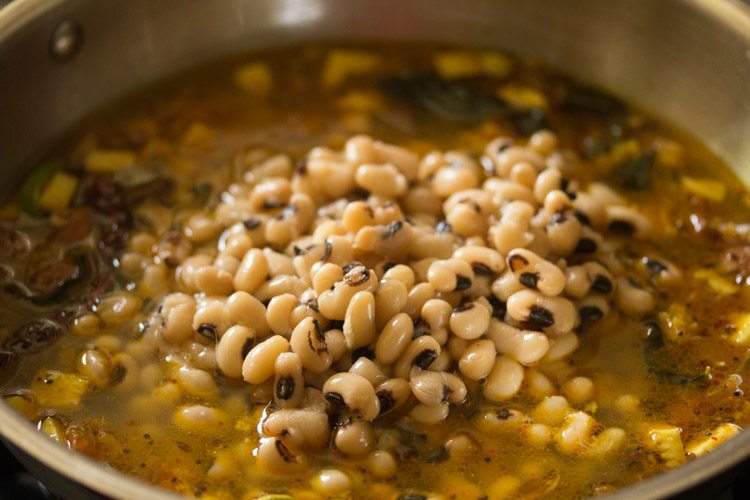 22. add the cooked vellapayar or black eyed peas. 25. on a low to medium-low flame simmer vellapayar curry for 12 to 15 minutes till the gravy thickens. with a spoon mash some vellapayar (lobia) to thicken the gravy. 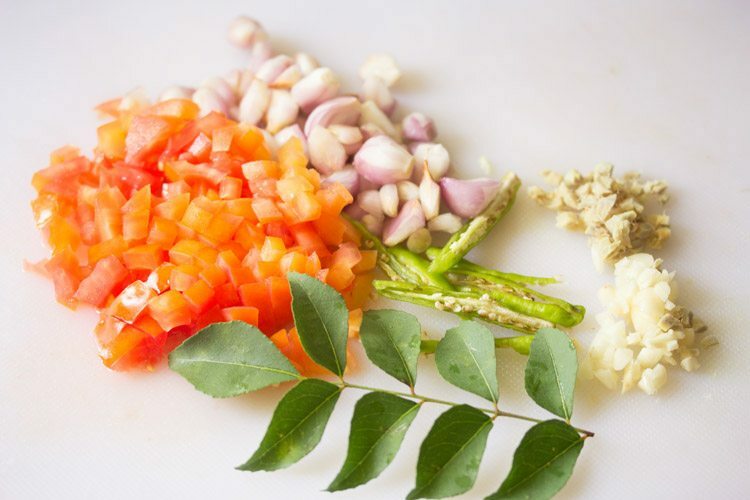 26. once the vellapayar curry is done, then switch off flame and add 3 to 4 curry leaves. also drizzle 1 teaspoon coconut oil. stir and cover the pan. let the flavors infuse for 4 to 5 minutes. 27. serve kerala vellapayar masala curry with steamed rice, puttu or appam or idiayappam or kerala parotta. 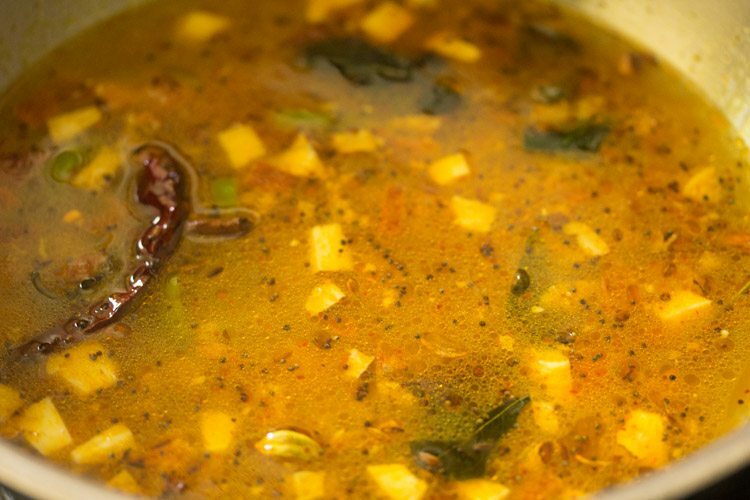 you can garnish kerala lobia curry with coriander leaves if you want. 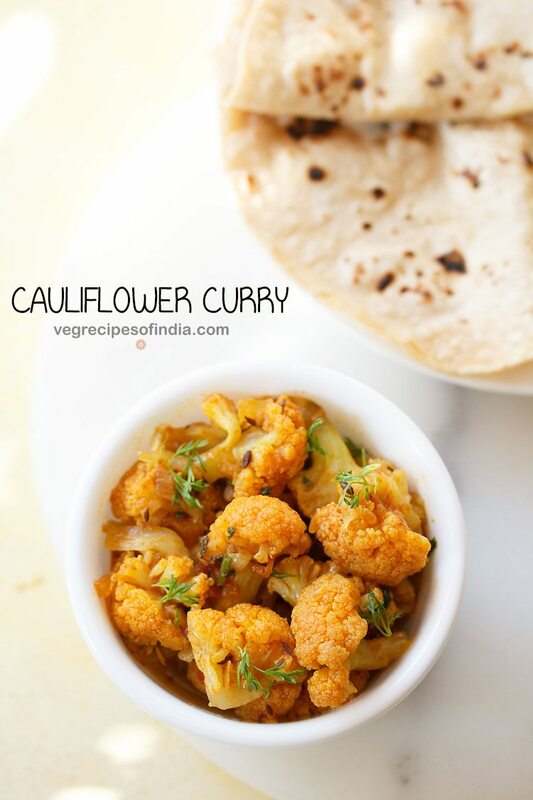 thanks shree for sharing feedback on this recipe. yes it does goes well with rotis, but we have with steamed rice as well. Trying this now. Looks similar to Kerala fish Molly. I am loving your recipes! I’m learning how to cook indian food and your blog has been very helpful. I am just wondering when you should add the coriander and turmeric powder because i couldn’t find when to add them in the recipe. I ended up just adding them to the onions. Thanks! thanks niecie. 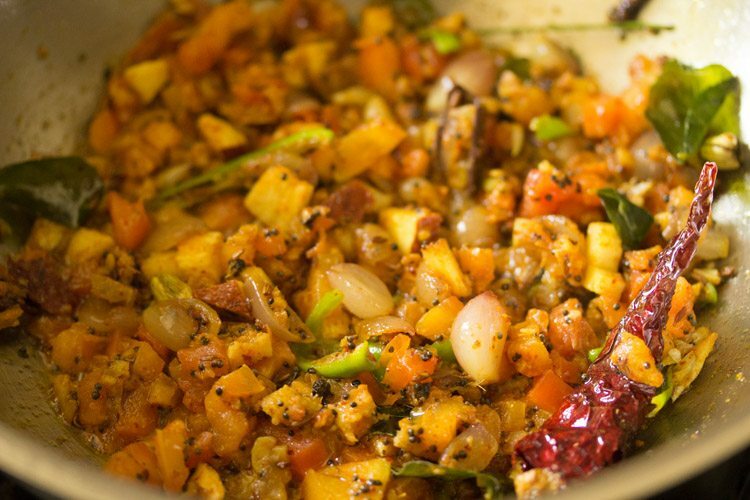 you can add the coriander and turmeric powder once the onions become soft or you can also add when you add the tomatoes. i will update the recipe too. i hope the curry was good. wonderful presentation dear and i think you have taken the right decision to change into a strict vegatarian. thanks neela. has helped me a lot in terms of health and well being.